Grand Photography is a responsive clean and minimal WordPress theme for Photography Creative Portfolio web site. Built with the latest WordPress technology. Grand Photography support responsive layout so it looks great on all devices. It has predefined styling & templates and many features built specially for photographer, creative designer, design agency which can be imported with one click. 80+ predesign templates for photo gallery & portfolio. As uniquely showing your works are very crucial, we focus on creating the various predesign templates of photo gallery & portfolio to match your styles. Moreover, simple steps are required to create with our pre-defined templates and content builder. Video Parallax Make your website more attractive from your visitors by video parallax. Collection Page Group your gallery to show your works easier as example. Your website may have the wedding projects with 2 clients. For each client, prewedding and reception are included. Therefore, you can use collection page to show your wedding project, gallery category shows 2 clients and galleries show each jobs which are prewedding and reception. Various Payment OptionsWooCommerce comes bundled with the ability to accept major credit cards, PayPal, BACS (bank transfers), and cash on delivery. Enhance Coupon OptionsCreate gift certificates, store credit, coupons based on purchases and more. Shopping CartYou can sell both physical and digital goods in all shapes and sizes, offer product variations, multiple configurations, and instant downloads to shoppers, and even sell affiliate goods from online marketplaces. Redirect only When users download a file, their link redirects to the file. Force download File downloads are forced, using PHP. X-Accel-Redirect/X-Sendfil Downloads are handled by the server (nginx/apache). This method requires the X-Accel-Redirect/X-Sendfile module be installed and enabled on the server. Confirm with your web host that one of these modules is installed before using this method for your store. Direct Purchase link option support for each images Increase your image selling by offering the link of direct purchase for each image to your customers. Customers just click the purchase link of each image they would like to buy. Customer Protection Theme support password protected gallery, right click protection and image dragging protection to protect your work. Photo Proofing Not only theme supports password protected gallery but also photo proofing feature. So, you can provide an access to certain gallery and let your customer approve or reject images within gallery easily. Client Archive Page With theme’s client module, you can assign multiple galleries to each client. You can also create client archive page so it displays all clients on single page. Your clients just a click on their image to login to see their galleries. Notify photographer Theme will notify photographer via email after your clients finish selecting pictures. 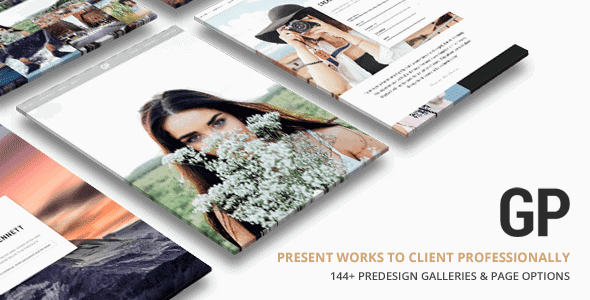 70+ predesign template for photo gallery & portfolio Photography focuses on gallery & portfolio modules to let you show your works uniquely and require simple steps to create with our pre-defined templates and content builder. Awesome 24 Predefined Demos Get your website working in short time with our pre-defined 24 demos covering light and dark scheme. Only One Click for Importing Demo Contents Quickly and easily import our demo contents including pages, posts, sliders, widgets, theme options and other settings with only one click. 9 Predefined Single Portfolio Layouts Display your portfolio professionally and easily by our predefined single portfolio layout. 10 Blog Templates Multiple single blog post layouts are the powerful features to use in different purposes. Post content is flexible to display with images, gallery slider show or with other video source ex. Youtube, Vimeo, and self-hosted video Also, blog post support various content including photo, gallery, video, soundcloud etc. 8 Menu Layouts with 8 menu styles and various customizable options so you can easily create your own menu design.